What's sweet, earthy, and a delicious, cool treat for the summer? 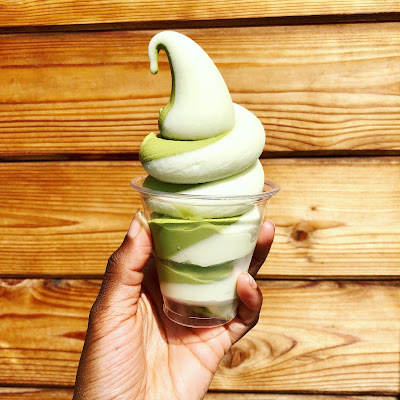 Matcha soft-serve ice cream! 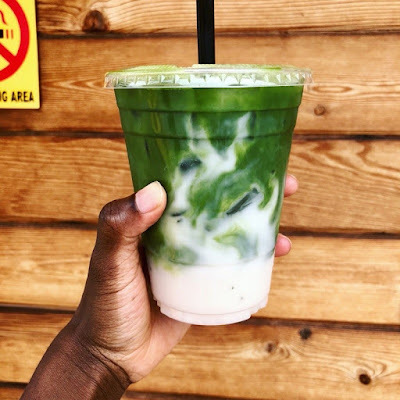 On I street, nestled on the outside of DC's Farragut Square district, is Bon Matcha, a small shop that sells, you guessed it, Matcha ice cream. If you're not familiar with Matcha tea, it is tencha tea that is ground up into a fine powder. When served as a traditional tea, it is whisked in hot water right before drinking. It is very creamy, with an earthy and full-bodied taste. But Bon Matcha takes this traditional tea, and jazzes it up creating ice cream and swirling it with a sweet honey dew melon flavor. The result is a really satisfying and sweet soft serve perfect for summer. My first trip there, an impromptu walk suggested by my boss to cool down on a sweltering day, sadly did not result in any ice cream (I ended up getting a iced matcha latte, which was still really good). They ran out of a cream. But today, I finally got to taste this green soft-serve, and it was definitely worth the wait!